Annabelle Worthington, 19, lives a fairy-tale life thanks to wealthy and doting parents. Then she gets the flu and is unable to accompany her family on vacation. Unfortunately, the Worthington clan has booked passage on the newest luxury liner, the Titanic. Her father and brother die when the ship goes down, and although her mother, Consuelo, survives, she is traumatized. As for Annabelle, she throws herself into work as a medical volunteer at Ellis Island. There she meets Josiah Millbank, a gentle, loving man who’s old enough to be her father, and marries him. But Josiah has a scandalous secret, and after their divorce, Annabelle is unfairly relegated to life as a pariah. Embarrassed and disillusioned by the treatment she receives from her acquaintances and so-called friends, Annabelle leaves for war-torn France to put her medical skills to good use in a female-run hospital on the front. But fate has even more in store for Annabelle. This was my first Danielle Steel. The woman has written nearly 100 novels and I've not read a one of them! So I thought it was time. I chose something new that had an old setting. I love the period drama's. It had a WWI setting but contemporary issues. I kept waiting for something good to happen, that wasn't. Some parts were written too fast when I wanted more detail. Overall it was a good book. Interesting story, and a heroine that has a lot of independence, heart, and intelligence. It was good. I would like to read another Danielle Steel. Anyone know of a really good romantic one? How funny that your first Danielle Steel had something to do with the Titanic. My first Danielle Steel (that I LOVED) was called No Greater Love and also had to do with the Titanic. She has one coming out this year that I can't wait to read it's called Big Girl. I really enjoyed No Greater Love also. I'd also recommend Changes and Full Circle. Those are 2 older ones but I enjoyed them both immensely. I avoid Danielle Steel. Perhaps on principle. :-) But power to you for tackling one, and for liking it! What principle do you avoid her by? I like the sound of this one! Thank you! My favourite Danielle Steel is Wings, it is very romantic! Wow, Danielle Steel has written nearly 100 novels? I haven't even read one yet! I'll have to fix that. Nice review, btw! The principle is that she's written SO many (OK, there might be a jealousy factor in there!) and--from what I've heard--if you read about 5 of her books, then you've read them all. And for books without a great deal of substance, it irks me that they circulate so well. Again, perhaps a jealousy thing there? But that's the principle I made for myself. hee hee That and I'd rather be reading the other 400+ books on my to-read list. 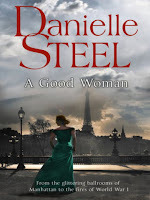 I have read a few Danielle Steele novels, but the only one that really stood out to me is Crossings. Now granted, I was probably in 9th or 10th grade when I read it for the first time, but I loved that book. I have never read another one of her books that I thought was anywhere close to it. It's a love story that spans countries, wars, and different marriages to other people. My mom used to read Danielle and says her "old" books are much better than her newer stuff.